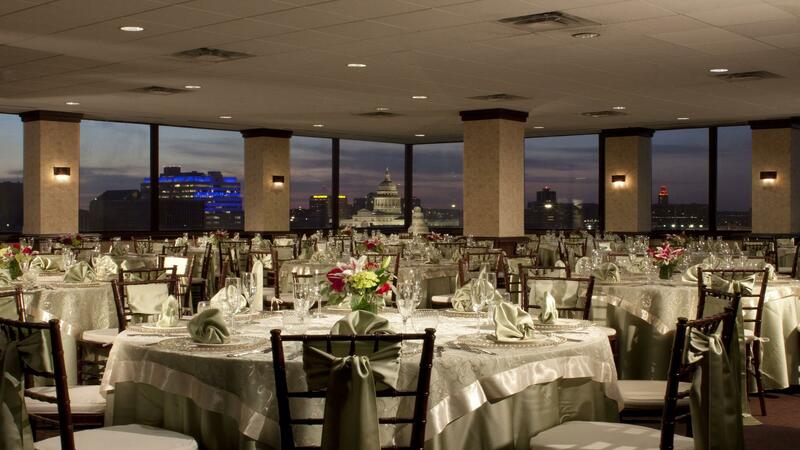 Rent Hilton Austin Airport | Corporate Events | Wedding Locations, Event Spaces and Party Venues. Enjoy the unique combination of history and hospitality at Hilton Austin Airport. Ideally located on the grounds of Austin Bergstrom International Airport, just two minutes from the terminal, this Austin hotel provides a complimentary shuttle service to the airport 24 hours a day. Settle in spacious Austin airport hotel rooms with modern amenities and complimentary wireless and wired high-speed internet access, or choose a suite with an additional boardroom, fitness room or living room. Appreciate the architecture of the hotel building which was once used as a strategic air command center. Referred to as ‘the donut’ because of its unique round shape, the hotel has an open atrium. Located adjacent to the Austin Bergstrom International Airport and close to Circuit of the Americas, Hilton Austin Airport is in an ideal location for gatherings and conferences. Choose from a variety of on-site locations, including a ballroom, boardrooms, and the spacious atrium. Planning large meetings here is exceptionally simple with our versatile exhibit space. Hilton Austin Airport offers outstanding first-class service for meetings and banquets that will go above and beyond expectations. From the first moment guests arrive to the time they leave, our staff will ensure the entire event is a success. Hilton Austin Airport is a Green Seal Certified hotel. Our meetings and events commitment to sustainability includes having recycling bins throughout all meeting spaces, using environmentally preferred materials and cleaning products and installing individual temperature control in all rooms. We also use double-sided printing on post-consumer recycled paper, menus with local and organic dining options and composting. The hotel donates left-over food to local charities.